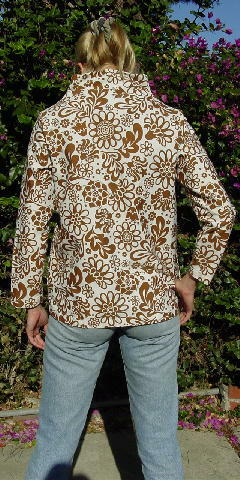 This vintage jacket is made of Koratron, which never needs pressing. It has a zipper that goes from top to bottom, long sleeves, and 2 side pockets. The background is white with brown flowers and leaves. It screams '60s flower child. It's from a stylist's collection, and was used in a magazine photo shoot with Old Navy jeans, flip-flops, a Roberto Cavali Freedom hat, and a "Paddington" bear. 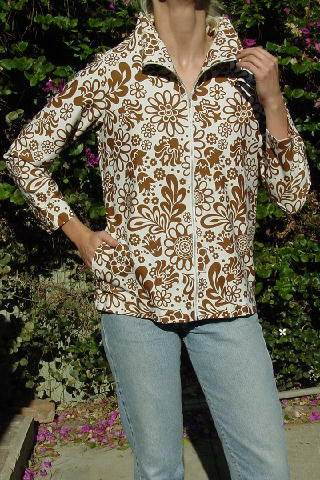 It can be worn with pants, capris, walking shorts, or jeans.